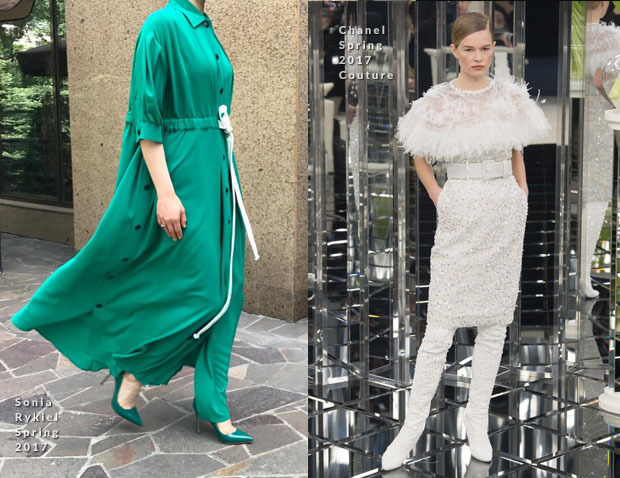 While Michelle Williams was racking up a LV double, Julianne Moore was also setting her own path by opting for two French brands for the ‘Wonderstruck’ photocall and premiere during the 2017 Cannes Film Festival today (May 18). Photocall: Green and red has always been fruitful red carpet combination for Julianne and this leafy Sonia Rykiel Spring 2017 dress was no different. Despite the bold hue, the look is relatively understated, offering a modern take on the classic shirt dress with timeless appeal. The look was styled with Gianvito Rossi ‘Coco’ sandals. Premiere: Much like green and red, Julianne and Chanel have always produced awe-inspiring results. I was already swept away by the embellishments, but feathers always adds an additional eye-catching allure. Gianvito Rossi ‘Portofino’ sandals and Chopard jewels induced more shimmer and shine.